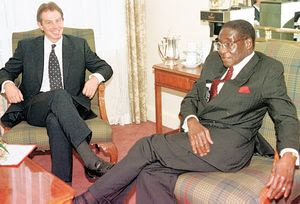 Tony Blair secretly courted Robert Mugabe in an effort to win lucrative trade deals for Britain, it has emerged in correspondence released to The Independent under the Freedom of Information Act. The documents show that the relationship between New Labour and the Zimbabwean President blossomed soon after Tony Blair took office in Downing Street. Just weeks after the Government unveiled its ethical foreign policy in May 1997, the British PM wrote a personal letter to Mr Mugabe congratulating him on his role in unifying Africa and helping to improve relations between the continent and Britain. The signed message, which welcomed Mr Mugabe's appointment as leader of the Organisation of African Unity, paved the way for an attempt to bring the two leaders together in a face-to-face meeting in Downing Street during the first weeks of the New Labour administration.